I have a sweet treat for you this Friday! 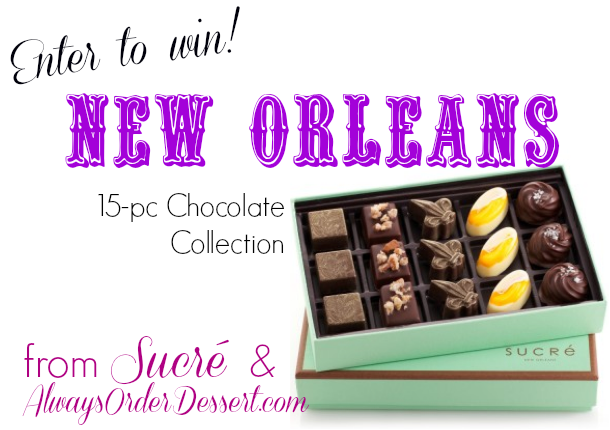 Inspired by my recent travels, I have a delicious New Orleans Chocolate Collection giveaway ($30 value) for you from one of my favorite shops in that fine city, Sucré . The chocolates in this particular box are each inspired by the flavors of the city, including Coffee & Chicory, Praline Pecan, Brown Butter - Meunière, Bananas Foster, and Caramel & Sea Salt. **You can get extra entries by doing any of the following and leaving a separate comment for each one you did. If you don't leave a separate comment, it's just going to count as one entry so LEAVE A SEPARATE COMMENT. You can leave up to 6 comments (entries) total. 1. Like Always Order Dessert on Facebook. Already a fan? Leave a comment on the page to say hello, then comment here to say you did. 3. Post about this giveaway on your own personal or fan page Facebook wall, tagging my FB page, then comment here to say you did. 5. "Pin" an Always Order Dessert recipe or post of your choice on Pinterest and then comment here to say you did. The winner will be selected via Random Number Generator. Your entry must be in by 5PM EST on Friday, September 13, 2013. US residents only, please.